I was pondering how long and severe the winter was this year and realized that with June knocking on the door we are half way through the journey of 2014. I started thinking about timelines and decided to review the following…. 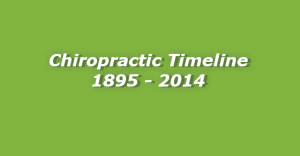 1895 – Dr DD Palmer performs the first adjustment and coins the term Chiropractic. That same year Wilhelm Roentgen discovered X-Ray. 1906 – Dr DD Palmer is jailed for 23 days for practicing Chiropractic. They claimed it was practicing medicine without a licence. 1949 – Dr Ernest Huggins graduates in the first class of Canadian Memorial Chiropractic College. Newfoundland joins Confederation. 1963 – A chiropractic supporter President Kennedy is assassinated. Chiropractic is licenced in New York. 1964 The American Medical Association has a clandestine faction working on the elimination of Chiropractic. 1987 – A Federal judge rules in favour of Chiropractic vs. The American Medical Association. 2005 – Hurricane Katrina wreaks havoc along the Gulf coast.